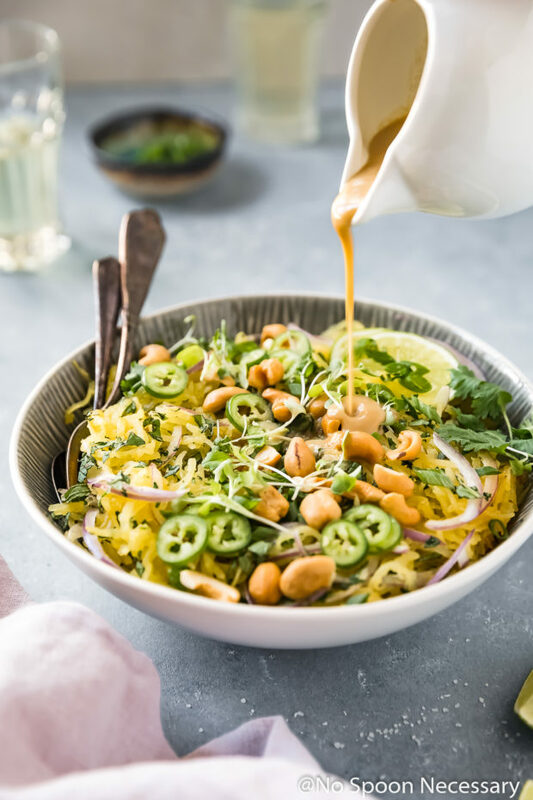 This easy, healthy Spicy Thai Spaghetti Squash Salad is jam packed with flavor and finished with a silky, smooth coconut based dressing. Light, yet satisfying this dish is perfect for light lunches and dinners, or you can top it with rotisserie chicken for a more substantial meal! This post was originally published in January 2018. I edited the photos and updated the post below to include more information about this healthy spaghetti squash. Plus, I added a recipe video to show you how easy this Spaghetti Squash Salad is to make! Today we are treating our taste buds to ALL the healthy flavor. Mostly because that’s how I like to roll, but also because the east coast (where I reside at the SuBourbon Country Cottage 2.0. Hi!) just got hit by another winter storm. And arctic, blustery weather = gimme all the fresh flavor. That way at least my stomach can pretend we are somewhere with warm temperatures and sunny skies. But sans the humidity, because no one likes that nonsense. 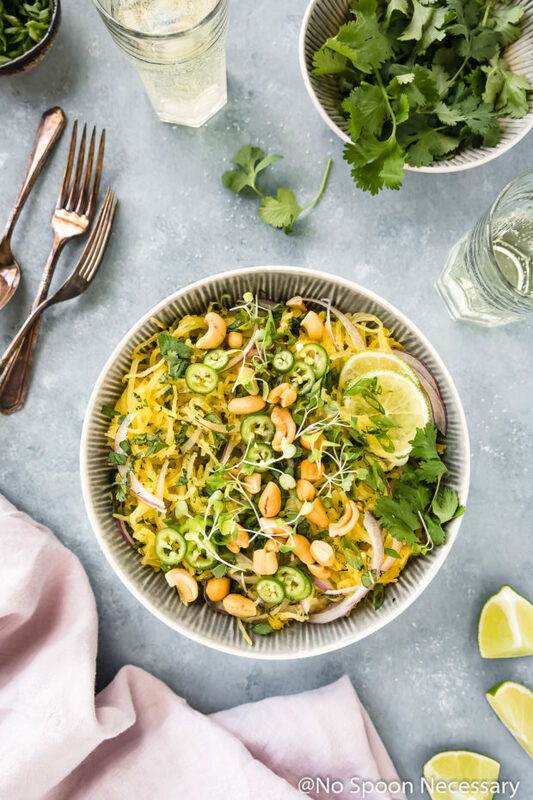 Savory, silky strands of spaghetti squash tossed with pungent red onions, herbaceous cilantro, fresh scallions, cooling mint, spicy serrano peppers and crunchy cashews. Finished off with a generous drizzle of a luscious, smooth, umami packed, slightly sweet coconut milk based dressing. This dish is the perfect balance of flavors – spicy, savory and sweet. It’s healthy and light, yet filling and jam packed with harmonious flavors. Basically, I’m currently crushing on this spaghetti situation like whoa. 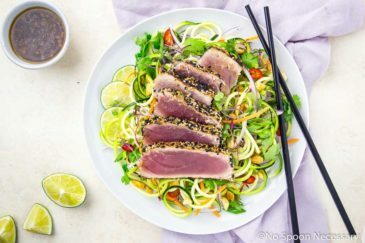 It feels slightly decadent (because, hello it looks like yellow pasta), but in fact it’s rockin’ ALL the healthy vibes (antioxidants, dietary fiber, healthy fatty acids, vitamin C and then some). 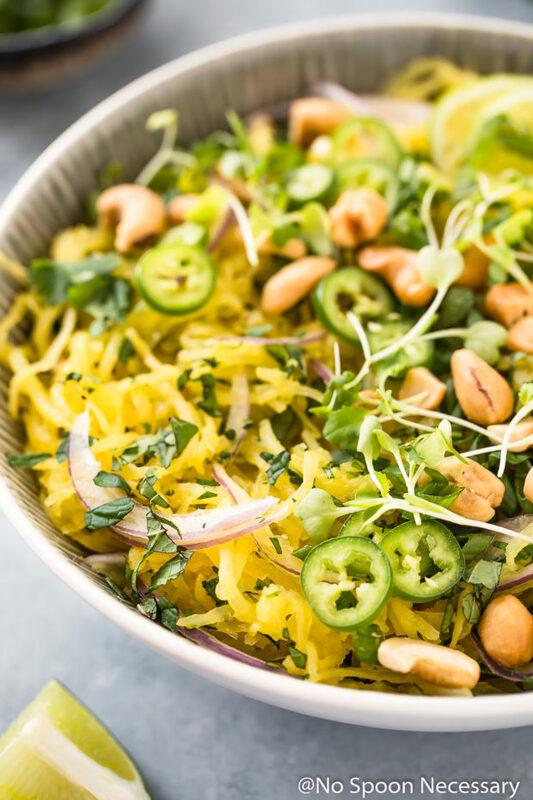 What to serve with Spaghetti Squash Salad? 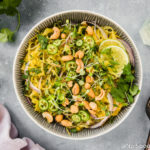 While this Spicy Thai Spaghetti Squash is hearty and filling enough to be eaten as a meal, you can top it with cooked chicken, turkey, salmon or shrimp to make it more substantial! Or, if you are looking to serve this squash salad as a side, you prepare any protein seasoned however you would like as the main dish. If you are looking for side options, this spaghetti salad would be delicious paired with cucumber salad, pot stickers, spring rolls, egg drop soup, or fried cabbage to name a few! Essentially, you can pair this spicy salad with any type of Thai or Asian starter or side you would like! How to easily cut spaghetti squash? If you have a really hard time cutting spaghetti squash in half, there is a trick to make it easier! Simply cut a few small slits in the squash flesh, along the same exact path you plan to slice it (lengthwise), and then microwave the squash whole for 5-6 minutes. Allow the squash to cool and then proceed to cut it in half along the line you already outlined. How to roast a spaghetti squash whole? Or, you can always skip cutting the squash in half all together and roast the squash whole. You will need to prick the squash all over with a small sharp pairing knife first, then transfer the squash to a rimmed baking sheet and roast for about 1 hour 20 minutes, or until the squash is tender when pierced with a knife. Just a note about this method, you won’t get the same caramelized flavor on the spaghetti squash strands as you will if you roast halved spaghetti squash! If you don’t like cilantro, you can substitute fresh Thai basil for the most comparable flavor. If you can’t get your hands on Thai basil, feel free to use fresh parsley, however it will change the flavor profile of this dish. 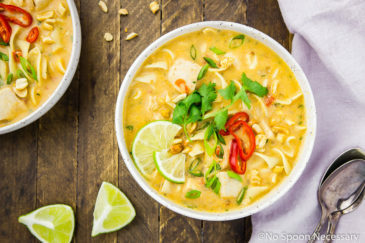 I used full fat coconut milk in the recipe below because it lends the most luxurious mouth feel. You can substitute low fat coconut milk, but the dressing will have a thinner texture. The dressing can be made up to 3 days in advance and stored, covered, in the refrigerator. Shake well before using! The Thai Spaghetti Squash will keep up to 3 days stored in an air tight container in the refrigerator. However, I would not add the fresh herbs, cashews or dressing until just before serving. 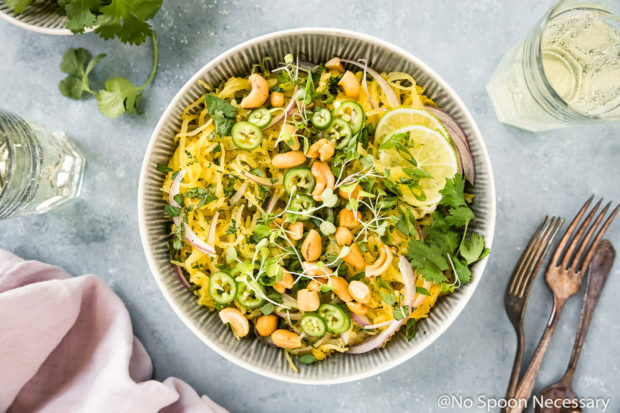 Easy to make, healthy for you, AND downright delish, this Healthy Spicy Thai Spaghetti Squash Salad is like a fake pasta party for your taste buds! Until next week, friends, cheers – to healthy vibes and thinner thighs . 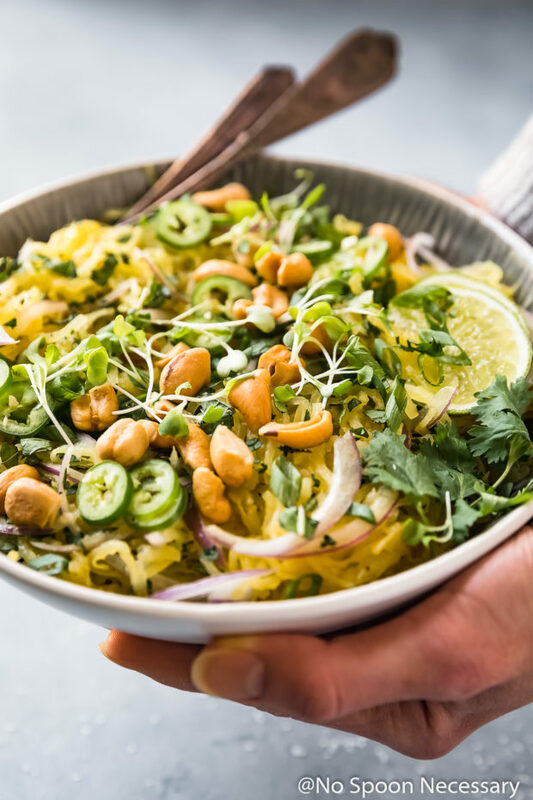 This easy, healthy Spicy Thai Spaghetti Squash is jam packed with flavor and finished with a silky, smooth coconut based dressing. Light, yet satisfying this dish is perfect for lunch and dinner or you can serve it with rotisserie chicken for a more substantial meal! Preheat oven to 375 degrees F. Line a baking sheet with aluminum foil for easy clean up and spray with nonstick cooking spray. Roast the squash: Drizzle the insides of each half of squash with olive oil and generously season with salt and pepper. Place the squash, cut-side down, onto the prepared baking sheet. Transfer to the oven and roast for 45 minutes – 1 hour, or until the squash is easily pierced with a fork and cooked through. Set aside until cool enough to handle. Once cooled, use a fork to scrape strands from the skin of squash and transfer to a serving bowl. Meanwhile, make the dressing: In a small saucepan, heat the vegetable oil over medium heat. Add the garlic, pepper and ginger, and season with salt. Cook for 1 minute or until fragrant. Add in the fish sauce, sugar and vinegar. Cook, stirring often, until caramelized, about 3-4 minutes. Remove from heat and stir in the coconut milk and lime juice. Use an immersion blender to puree, or transfer to a food processor (or blender) and puree until smooth. Taste and adjust for seasoning with salt. Set aside. Assemble the salad: To the serving bowl with the squash, add the cilantro, mint, jalapenos and both types of onion. Pour in the dressing and toss to combine well. 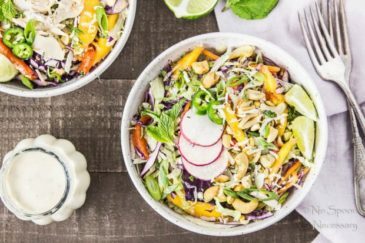 Garnish with cashews and drizzle with fresh squeezed lime juice. Serve and enjoy! If you don't like cilantro, you can substitute fresh Thai basil for the most comparable flavor. If you can't get your hands on Thai basil, feel free to use fresh parsley, however it will change the flavor profile of this dish. The Thai Spaghetti Squash will keep up to 3 days stored in a air tight container in the refrigerator. However, I would not add the fresh herbs, cashews or dressing until just before serving. This looks delicious! Great way to add some flavor and kick to that dish with those spices! Great recipe!